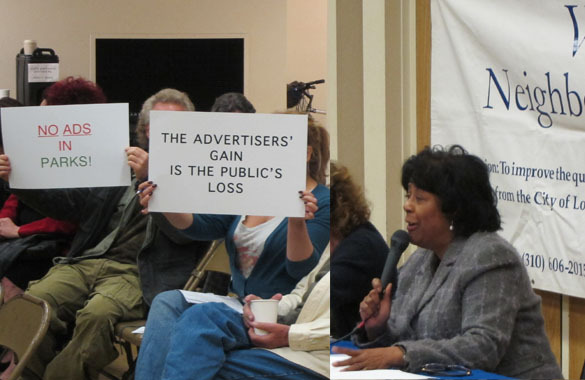 People holding signs saying “No Ads In Parks” and “Parks Are Sanctuaries” were scattered through the audience Tuesday night when L.A. City Councilwoman and mayoral candidate Jan Perry spoke before the Venice Neighborhood Council. Perry, a vocal proponent of selling advertising in parks and other city properties to raise revenue for the city, told the dozen or so protestors that local communities could “opt out” if they didn’t want advertising in their local parks and recreation facilities. Perry didn’t elaborate on how such a plan would work, since people representing community groups in areas with many of the city’s most popular, and presumably, most attractive parks for advertisers have voiced objections to the idea, first raised a year ago by the city’s Recreation and Parks Commission. People living near Venice Beach, much of which is under Rec & Parks control, have been particularly vocal about keeping the area ad-free. According to Linda Lucks, the Venice NC president, Perry had asked to come and speak to the community on city issues. These issues didn’t include park advertising, but Perry chose to briefly address it before moving on to other subjects. See video below.